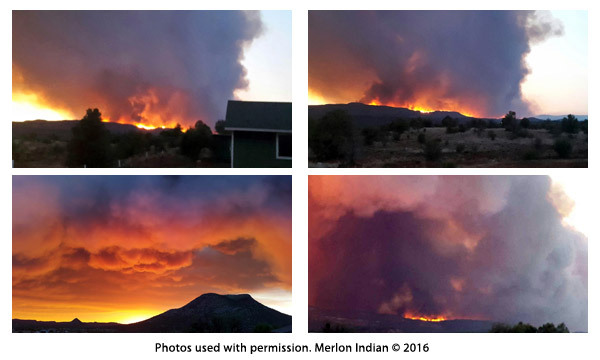 In June of 2016, wildfires raged near the tiny White Mountain Apache tribal community of Cedar Creek, which destroyed thousands of acres. 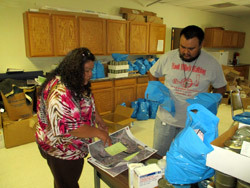 Generous donors throughout the country made it possible for us, working through our Navajo Relief Fund program, to make three deliveries of essential items — from water and flashlights, to first aid supplies and batteries, and additional products that were helpful to families in this emergency! We arrived in the Whiteriver community of the Fort Apache Reservation following the fires that scarred the area. The response to community’s needs was very much in play during our visit. Preeo, our Program Partner at the CHR post in Whiteriver, was busy. When we arrived at the fire station, we found the meeting room had been set up as a makeshift response room with our boxes lining the walls and floor area. Preeo, our Program Partner at the CHR post in Whiteriver, was busy attaching household names to area maps which served as the delivery sheets. 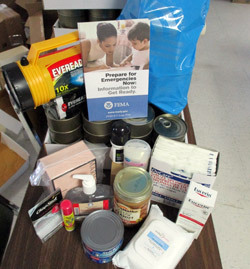 Preeo estimated that 200 families would receive the supplies. Preeo estimated that 200 families would receive the flashlights, food and first aid supplies that were sent to be distributed. She explained that it was important to unify the efforts into one district. They created a phone tree to ensure contact with the residents. Carrizo and Cedar Creek were two of the smaller communities that were hit hard. Preeo felt good that there was a CHR in each of the communities, particularly when the community didn’t have cell service. These CHRs were important links for rural residents, particularly during emergencies. Preeo explained about the different departments that have been involved in the response. She said, “The levels of staff that contribute to the planning is complex.” They all had additional duties besides their main job responsibilities, but she said it worked. 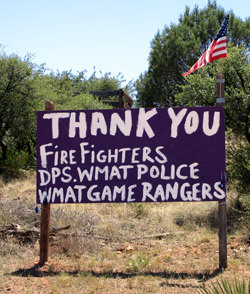 Homemade signs lined the community thanked the responders for their actions. She also reiterated the issue of flooding. During monsoons, the bridge often washed out and there were homes in the path that sat right on the banks. These homes were targeted for the supplies and the sandbagging efforts were evident on the way into Whiteriver. The ground was much more unstable with the fires taking out some of the vegetation. They had already dealt with two rains since the initial fires in mid-June. People were worried about their homes, but tried to be prepared. The items we delivered were being boxed and bagged with cases of water going out to help families establish their own preparedness kit for their households. It was clear that the community appreciated all the work that had gone into the response. Homemade signs lined the community thanked the responders for their actions against fire and flooding.